Small pot of delicious vanilla Drink Me Chai. A fragrant blend of sweetened tea, milk and creamy vanilla. Just add water or milk for a deliciously spiced drink. 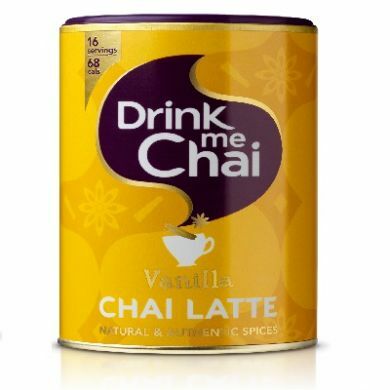 An instant blend of vanilla with spices, skimmed milk and sweetened black tea. Add to baking or sprinkle over porridge. Transport yourself for a moment to the vibrant heart of an Indian market... to where Chai wallahs sell their special brand of spiced, sweetened tea in small clay cups. This is where it all began - and where people have been enjoying the sensuous exoticness of chai for centuries. 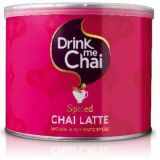 I'd been passionate about sharing chai with as many people as possible since my first sip - and had set about creating a delicious, authentic recipe for the UK market. 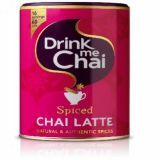 I really wanted to produce a drink that would take the palate in a new direction; something that would surprise and excite - and after countless samples (and several tweaks), Drink Me Chai was born. Sugar, Skimmed milk powder, Vegetable coconut fat, Dried glucose, Black tea extract (2%), Colouring: caramel, Thickener: Cellulose gum, Vanilla flavouring (0.6%), Cinnamon (0.5%), Caseinate (milk), Spices, Stabiliser: E451, Natural flavouring. 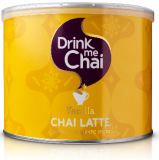 Vanilla Chai Latte: Put 3 teaspoons of Drink Me Chai in to a cup. Add hot water and stir well. For an extra creamy texture use half hot water and half hot, frothy milk.